Focused, high-quality PreK-3 systems provide us with the greatest potential for achieving World's Best Workforce (WBWF) goals. PreK-3 systems with a broader scope, including collaborations with other organizations and providers, enable communities to focus their efforts on maximizing child outcomes. These workshops are about learning and doing. District/community teams will spend time learning about evidence-based school improvement strategies within a PreK-3 system, followed by dedicated time spent on ensuring the most impactful school improvement strategies are effective in your PreK-3 system. Alignment and coherence are a focus throughout the workshops where teams practice aligning on paper (e.g. practices, procedures, policies, etc.) followed by ensuring alignment in practice, which is coherence. Districts and charter schools must register in teams. Since the workshops are focused on action, team members should include those who are in a position to contribute to the design, implementation, and evaluation of your PreK-3 system. Suggested teams minimally consist of: early childhood administrator, elementary school principal, Head Start Director and community early childhood program leader. Day 2 teams should add a teaching and learning administrator or specialist. Team members may be different for each session. Team leaders should decide who is best suited to participate in each session. Dates and registration coming soon! One of the 3 aims of MESPA Institute 2013 is early education and preK-grade 3 alignment. Ruby Takanishi is one of the keynote speakers. Minnesota was very fortunate to have two teams (out of just 12 selected nationwide) selected to attend this institute. The Minnesota team was comprised of individuals from Bloomington School District, Brooklyn Center School District, MN Department of Education, MN Reading Corps, St. Paul School District and United Way. The Minneapolis team consisted of the chief academic officer, the early childhood director, principals, and teachers from the Minneapolis School District. The executive director of Way to Grow was also a member of this team. Needless to say, the state of Minnesota had a strong presence at this institute. 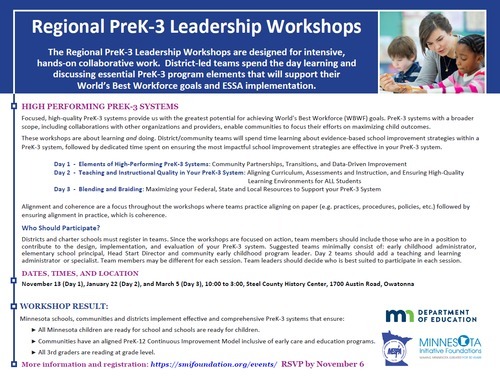 Most importantly, Minnesota is being recognized for not only some of our great work around PreK-3 initiatives, but also our potential to make great progress implementing high-quality PreK-3 programs. During the four day institute, we had the opportunity to learn from some of the top experts in the country. In Minnesota, we are confronted with the same educational challenges that other states face in the 21st century. One of our top priorities is closing the achievement gap, which encompasses many factors and issues. Now more than ever, we have to look to systems, elements, and practices that are the most beneficial to our children's learning and development. While we have decades of research that demonstrate the positive effects of early childhood programs, we now have a critical mass of research that extols the value of extending early childhood programs into the primary grades. Integrating high-quality early childhood programs into the K-12 system is one of the most effective things school districts can do impact learning and achievement. The most successful educational programs for our youngest children need to be comprehensive, span multiple years, and focus on important transition points. The focus of this conference was on how we can effectively create and implement a comprehensive, integrated, and aligned PreK to Grade 3 system. We first heard from one of the top experts in the country, Dr. Kristie Kauerz. Dr. Kauerz is the PreK-3 Education Program Director at the Harvard Graduate School of Education. She specializes in early education and elementary school reform. Dr. Kauerz has extensive state-level policy experience, which includes working with more than 40 states on issues related to PreK to Grade 3. To discuss how to implement a comprehensive system, we heard from another leading expert in the country, Dr. Jerry Weast, superintendent of Montgomery County Public Schools in Maryland (now retired). 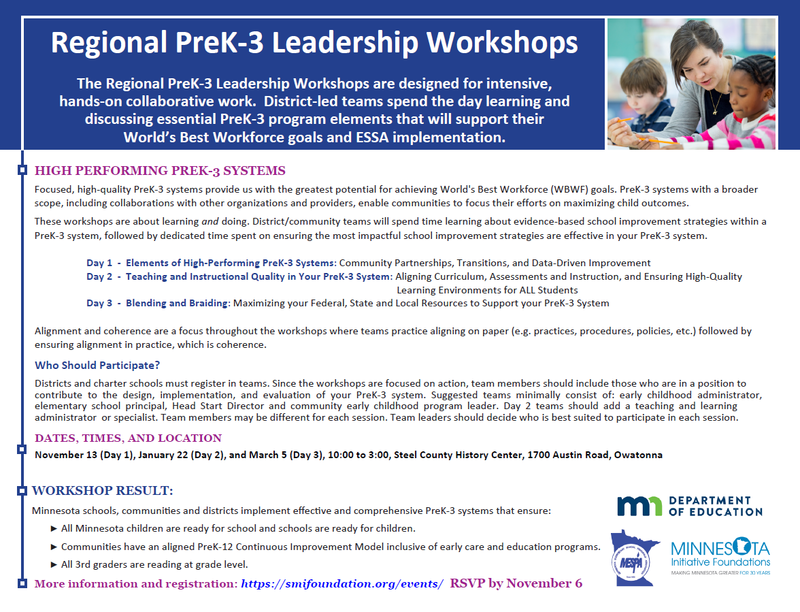 Then, we will learn from a panel of Minnesota school officials how they have incorporated PK-3 practices and programs into their K-12 systems. Last fall, the Pew Center on the States released a report lauding Montgomery County Public Schools PreK-12 strategy as a model for national reform (click here for Pew news release). Montgomery County Public Schools (MCPS) in Maryland has 144,064 students and 200 schools. Students represent 164 countries, speaking 184 languages. Demographically, about 37 percent of the students are White, 23 percent African American, 23 percent Hispanic, 16 percent Asian American, and .3 percent American Indian. Since 1998, MCPS has seen a 103 percent increase in the number of ELL students and a 44 percent increase in the number of children receiving Free or Reduced Lunch. Click Here for File One of our discussion topics was early childhood administration. While you play a critical role, please keep in mind that other administrators are also required in order to make the model successful. It is for this reason that PreK-3rd Grade conferences (e.g. MDE in 2011, Harvard PreK-3rd Institute in 2012, and Northland Foundation in 2013) often require team registrations. PreK-3rd is a collaboration and shared efforts. Thankfully, momentum is growing and others are understanding the importance of early childhood and alignment. For example, the Minnesota Elementary School Principals Association (MESPA) is lobbying for the model. If you do not yet have adequate support from other district administrators, you can still move forward with strategies, practices and improvements you can control or influence. Save the Date for an Outstanding Webinar on May 26! The Minnesota Department of Education (MDE) is planning a FREE webinar, “Harnessing Technology and Digital Media to Support Early Literacy in Prekindergarten and Kindergarten: Moving Young Learners Forward!” This MDE webinar is scheduled for May 26 from 3:30-4:30 pm – right after school so you can interact with the presenter! Presenter: Lisa Guernsey, Director of the Early Education Initiative and Director, Learning Technologies Project at New America (non-partisan think tank), Washington, DC. Lisa is a contributing author to Technology and Digital Media in the Early Years: Tools for Teaching and Learning (in-press). This one-hour webinar is designed for Minnesota educators in prekindergarten to Grade 3, parents, and other adults working with young children. An overview of current research on technology and early literacy development. Information about using technology to support literacy development on the ground – “seeding reading” (e.g., using video to model use to technology for literacy development with parents, remote guided reading, e-books, apps), and effective strategies for family engagement and home/school connections to support literacy development in young children. Time for YOU to ask questions! We plan to provide 1 CEU for participation in the webinar. Please share this information with all your school, district, parents, and regional contacts. More information will be coming soon!